Map incompleteness is something that I am very intrigued about. As shown in the example above taken in Paris, the city itself is well represented but as soon as you leave the "périphérique" (the highway-like infrastructure that surrounds the french capital), it's a blank grey void as if no one leaves beyond this limit. 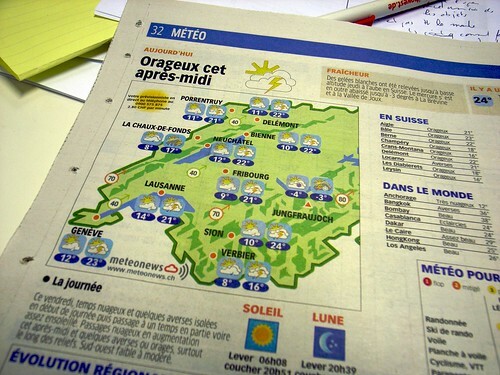 It's a phenomenon you also encounter with weather maps as you can see below: weather forecast generally stops at the border (clouds don't go through the customs, do they?). You can see the swiss map as if it was a stand-alone territory (lots of countries do it anyway). Why do I blog this? Map incompleteness is understandable in terms of information design: the use of "white space" can be relevant to "balance composition and induction properly". 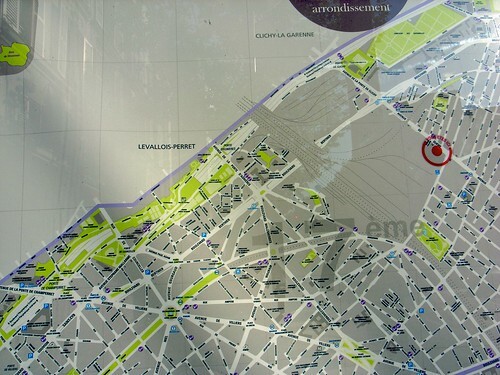 Designing maps and signage is a matter of simplification so that people could easily grasp the situation at hand. However, in both situations above I am often bothered by the simplification; not that I need to go across the border and would be happy to know the temperature, rather because it discretized phenomena that should be represented as continuous.